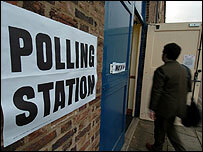 Voters are due to go to the polls in the biggest test of public opinion since the 2005 general election. The Scottish Parliament and local councils, the Welsh assembly and most local authorities in England outside London are all up for grabs. About 39 million people are entitled to vote in what has been dubbed 'super Thursday,' with warm weather forecast to boost turnout in many areas. Polling stations will open at 0730BST and close at 2200BST. But many people have already cast their ballots by post. The parties were out in force on Wednesday in a final push for votes, in what will be the final election for Tony Blair as Labour leader. In Scotland, there are elections for 129 members of the Scottish Parliament. The elections use a mix of the "first past the post system" and a form of proportional representation. There are also elections in all of Scotland's local authorities. The first results in Scotland are due to start coming in at about 0030BST on Friday. Wales is voting for 60 members of the assembly, again using "first past the post" and proportional representation. There are no council elections there. The counts are expected to take place overnight. In England 32.8 million people will be able to vote - with seats being contested in 312 local authorities. In some councils one third of seats will be up for election, in others, the whole council will be elected. There are also mayoral elections in Bedford, Mansfield and Middlesbrough. It is the biggest election in the local cycle in England, with about 10,500 council seats up for grabs. But more than half the counts in England have been delayed until Friday - rather than starting straight after polls close and counting into the early hours - because of a new postal voting system. Election officers must double check at least 20% (but preferably 100%) of signatures accompanying ballot papers with those on the original applications for a postal vote. It means a clear picture of the results will be unlikely to be available before Friday afternoon. There are also 12 pilot areas in which electronic voting is being tried out. Ministers moved on Wednesday to calm fears of postal vote fraud, insisting the new system would prevent abuses. It comes after new figures suggested postal vote fraud in 2004 council elections may have been more widespread than previously thought. Constitutional affairs minister Bridget Prentice said she was confident the new checks introduced this year were as "secure as possible".